A true story of one woman's journey from Islam to Christianity, this remarkable autobiography is an inspiring an encouraging read. The inspiring true story of a Muslim woman who had a life-changing experience of the living God and now lives her life completely sold out for Jesus. Russian born Shaadia Firoz grew up in a Muslim family, in the fearful shadow of her drunken and abusive father. From an early age she was searching for a close relationship with Allah but she could never find the peace she so longed for. Finding fame as a singer did little to fill her sense of emptiness, and a desperate search to fill this longing had her looking for love in all the wrong places. But everything changed when she encountered Jesus and she finally experienced unconditional love. Through health scares and healing, threats and potential relationship wrong turns, Shaadi has continued to follow Jesus, and now passionately lives out her calling to preach the gospel, even in the most costly or dangerous situations. Challenging, honest, raw and inspired - this is the remarkable true story of a real 'disciple' who lives all out for Jesus - no matter what the cost. 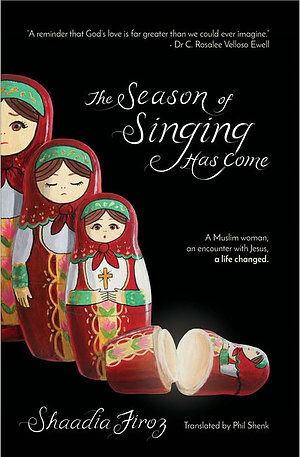 The Season Of Singing Has Come by Shaadia Firoz was published by Authentic in October 2018 and is our 1970th best seller. The ISBN for The Season Of Singing Has Come is 9781780784663. Be the first to review The Season Of Singing Has Come! Got a question? No problem! Just click here to ask us about The Season Of Singing Has Come.